My daughter asked yesterday whether we could be super organised this Christmas so that I could spend loads of time with the family and not be fiddling in the kitchen…. I usually try to get a lot done and stashed away in the freezer before the main event but last year, as we were a smaller gathering than previously, I left more to do on the day. This may be to what she was referring. Whilst I was still fairly organised I could, as I was told many times at school, have done better. The mistake I made was not to slavishly refer to all my do ahead tips. I am all for whipping things out of the freezer and cooking them in the stylish silver containers (Christmas sparkle) they were frozen in. I will then transfer them to warm serving dishes, chuck the foil containers and won’t have a mountain of sauce pans glaring at me from the sink. On this point I implore you to heat your serving plates – there are many components to the Christmas feast and getting them from the stove to peoples plates takes more than a minute of two. You want it served hot and warm dishes and plates makes a huge difference, that and piping hot gravy too. So this year I will be making and freezing the stuffing, cranberry sauce, bread sauce (add a little milk on heating) and gravy (add meat juices after resting to boost this) for the big event. Don’t laugh I will even be parboiling and freezing the roast potatoes (see tips). 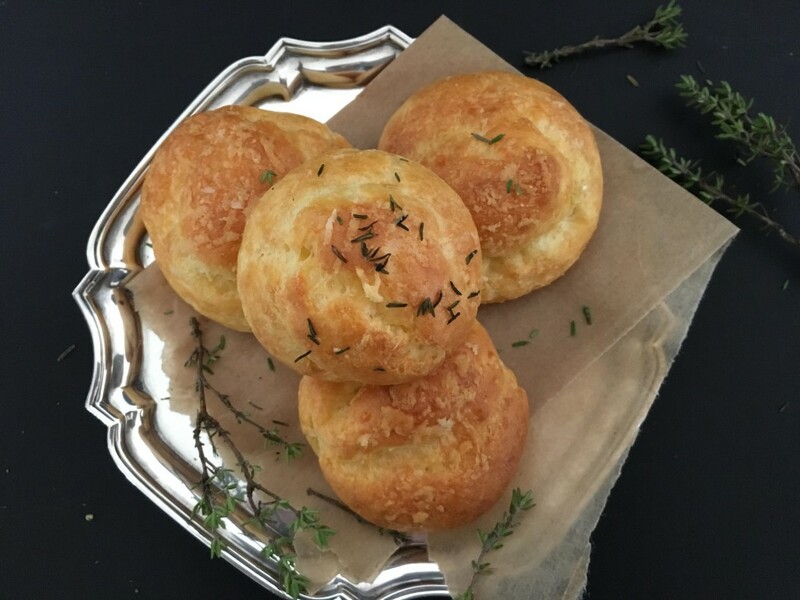 Sausage rolls, Cheese Sables with Rosemary Salt (December 2013) and Gougeres (recipe below) will be frozen in good time to accompany drinks alongside Spiced Cherries in Bacon which I am preparing now (and recommend you do the same!). Firecracker red cabbage (November 2013) to serve with Christmas Eve’s baked ham, a curry, a stew and lots of mince pies will also make their way into the frozen holding pen. Have I mentioned my Christmas tips (Do ahead Christmas tips and Spiced Cherries November 2013 and Feta and Spinach Parcels a couple more make ahead tips November 2013)?! I will be referring back to them again and again. It may sound bossy to suggest you do too but I know they make a world of difference on a day that is notoriously hectic. 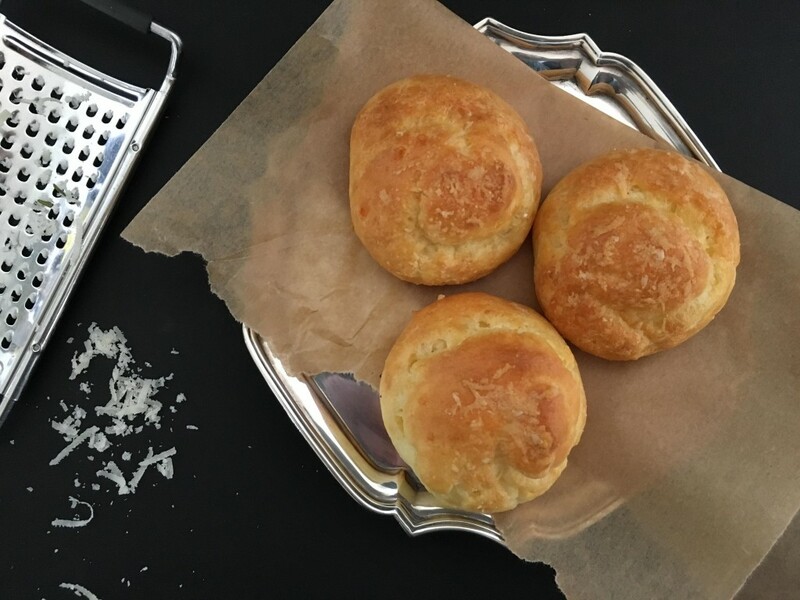 To get you started here are my Cheese Gougeres, warm little clouds of cheesy savoury deliciousness. I honestly struggled not to eat all the ones you see in the pictures. Very easy to make (baked not fried despite their light and fluffy appearance) and they freeze and reheat a dream. Make them now then open freeze flat on a tray, once frozen tumble into a bag or plastic tub. Serve these warm with drinks and you will undoubtedly be the hostess with the mostess. A good strong cheese is required here. I use a mouth tingling cheddar or a combination of cheddar and parmesan. You could take an Alpine route with gruyere to great effect. 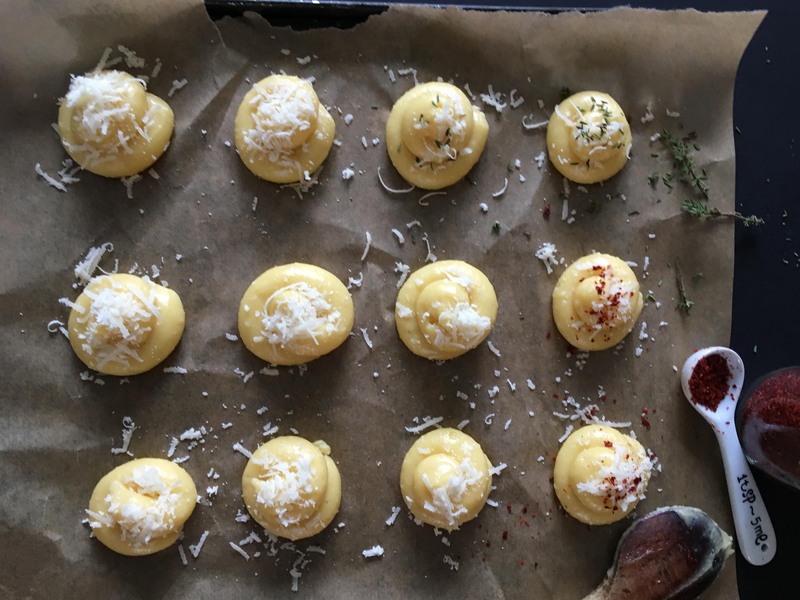 I sometimes like to add mustard or cayenne pepper for further pep and bite in which case sprinkle some tiny dried chilli flakes on the gougeres before you cook to indicate heat. Other times I might add thyme leaves or sprinkle grated parmesan as in the picture above but am just as happy to leave them unadorned and boldly goldly resplendent. Mustard powder/cayenne pepper/thyme leaves – see above. Preheat the oven to 200 and line a couple of baking sheets with parchment. Put the butter, water and salt in a pan, heat until the butter is melted then whoosh in the flour in one go and beat hard. Add the eggs one by one (the mixture will become a little sloppy between each addition but persevere) then add the cheese and stir until well combined followed by any additional flavourings (mustard/chilli). Either pipe small blobs onto the baking sheet or use two teaspoons dipped in hot water. I am no piping expert but find it the easiest route with this thick and sticky mixture. With a wet finger push down any pointy bits as these may catch and burn in the oven. Bake for 20-25 minutes, they need to be a good burnished gold and feel crisp if you tap one (cautiously). If underdone they will deflate on cooling. Cool on a wire rack if you are going to freeze (or keep in a tin for a day or two) or serve straight away. Reheat in a hot oven for 5 minutes. Makes 20-30 depending on size. There is nothing more satisfying than fashioning the proverbial silk purse out of a pigs ear. By that I don’t mean I regularly keep pigs’ ears in the fridge – although why I don’t know as they can be a proper treat. No rather that it pleases me immensely to make something out of leftovers or those hotch potch random ingredients that sometimes peer at me from the fridge. If it turns out to be delicious and a recipe to keep then so much the better. Following hallowe’en there were a lot of apples left from the bobbing. Those with rows of teeth marks went to the chickens but the pile of untouched ones have been gazing balefully at me for a week or so and the time had come to crack on. Apple sauce with last Sundays pork belly was a happy way for two or three to go and a crumble waits for tea today. 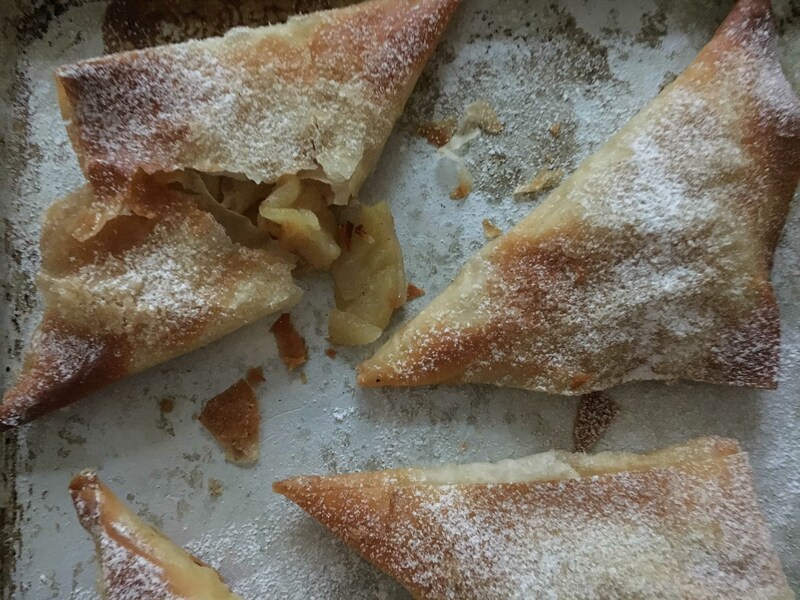 Yesterday I made these apple and cinnamon turnovers and on this occasion rather than my usual shortcrust or puff pastry route I chose to use up the half pack of filo left from the samosa recipe published previously. With butter, sugar and cinnamon being on hand I had nothing to trouble the shops for and served warm with vanilla ice cream the children were thrilled too. 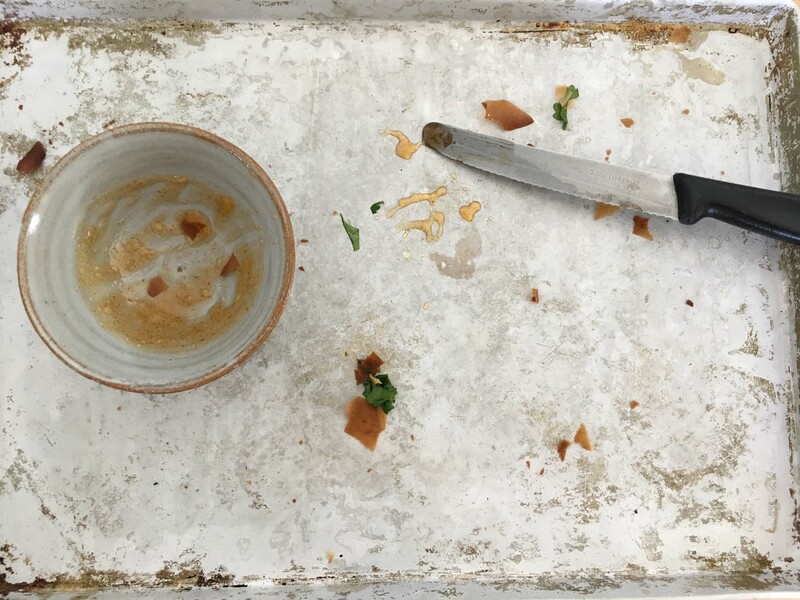 Happy customers 1 – Food bin 0. If you keep some filo in the fridge these would make a speedy and easy pudding over Christmas (or anytime). The extra dusting of icing sugar combined with cinnamon would give a suitably snowy finish and what could be more festive than cinnamon. Preheat the oven to 200 and line a baking tray with parchment. Peel and finely slice the apples, put them in a bowl with the sugar and cinnamon, stir well and leave for 10 minutes. 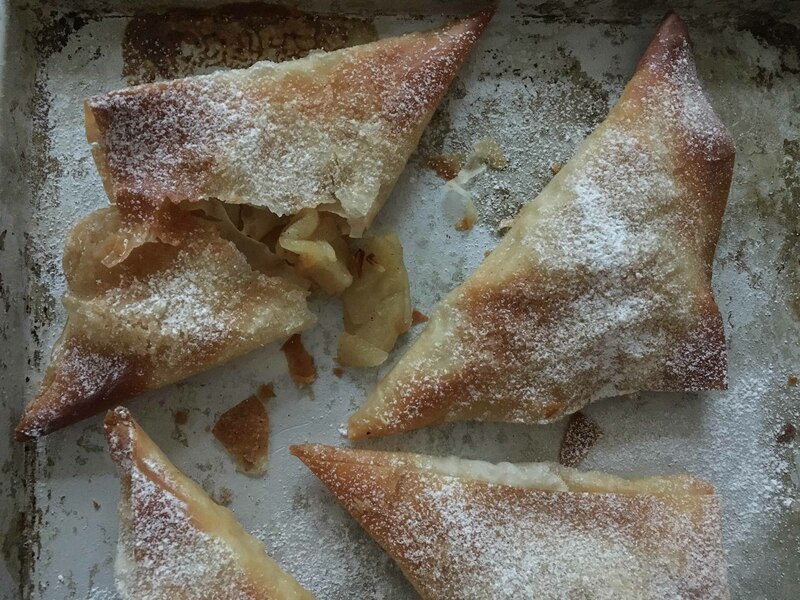 Lay out a sheet of filo with the short end facing you, brush lightly with melted butter, put a spoonful of apple on the top corner and fold the pastry over to the side, keep folding the parcel towards you, it will form a triangle (see pictures on previous recipe). Make the other 5 triangles, brush any remaining butter over the top and bake for 20 minutes turning half way until crispy and golden. 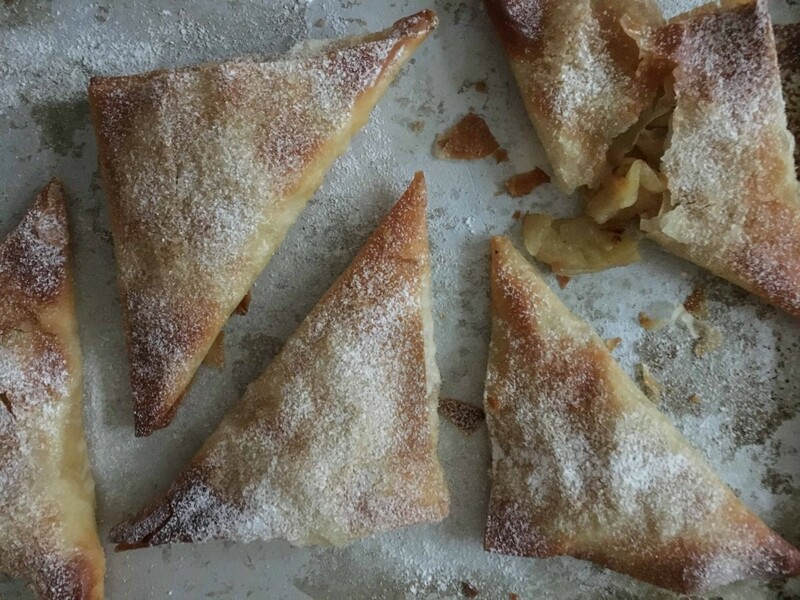 Cool a little then dust with icing sugar (add a little cinnamon to this if you want). Makes 6 which are wonderful served warm with ice cream or cream. There is something universally appealing about a delicious little treat served with drinks or as a snack. Whether a fancy pants canapé with drizzles and micro herbs or just a warm sausage with a spicy dip. Nothing brings out the greedy pig in me more and I have often positioned myself at the kitchen end of a marquee or party to be first in line. Maybe it is a throw back to handing around the olives and cheese straws at my parents dinner parties or a reminder of being on the other side of the green baize door creating hundreds of tiny treats I don’t know. Around Christmas the shops are awash with a myriad of bite size treats ready to be popped into the oven with the hard work done for you. They aren’t really my thing though. Its not just that I love cooking, the general fiddling around in the warm fug of the kitchen, although I do. More that the making of these little mouthfuls is part of the fun, the warm up to a party at any time of year and totally worth it when you see happy greed on your friends faces. 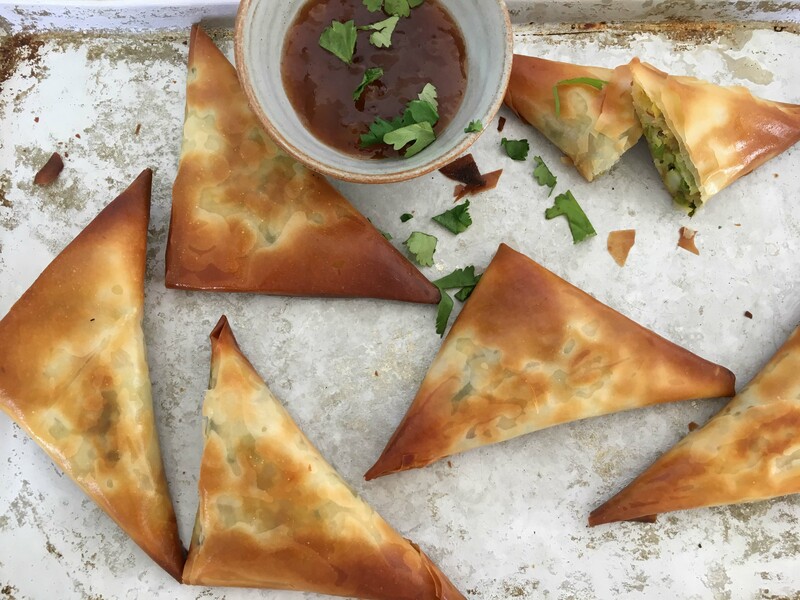 If all that Pollyanna style gladness isn’t enough to push you over the edge, here are some more ideas to go with your samosas. An all time easy favourite are my Cheese Sables with Rosemary Salt (December 2013) or Cannellini Bean Dip (April 2015). I adore crostini and bruschetta as both the toasts and topping can be prepared ahead so Artichoke Crostini (March 2013) and Pepper and Caper Crostini (April 2014) come to mind. Before supper in the summer I don’t think you can beat Tomato Bruschetta (July 2013). Or go for the moreish Crunchy Seeds (Things with drinks October 2012) or Grissini (May 2015). Finally an absolute favourite, particularly with children (and me) is the Onion Tart (November 2014) cut into little squares, I promise you they literally disappear. 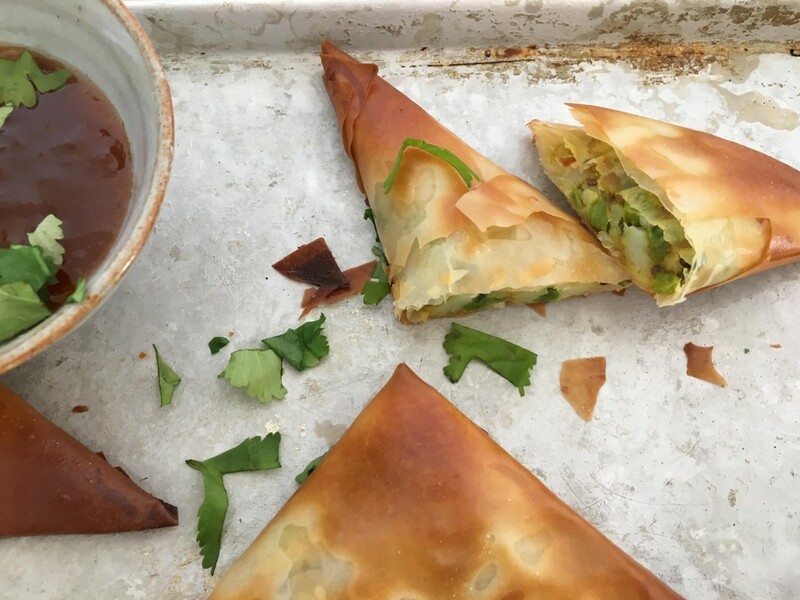 My husband particularly likes a samosa which is how these came about and they have gone down pretty well with everyone else. They are not too spicy, feel free to add a little chopped fresh chilli to the filling if you wish, so appeal to younger palates too. I like them dipped in chutney but a minty raita would be just perfect too. It is up to you whether you make these picnic size or canapé size, simply cut your filo accordingly. If you do make them very mini you might want to adjust the cooking time too. 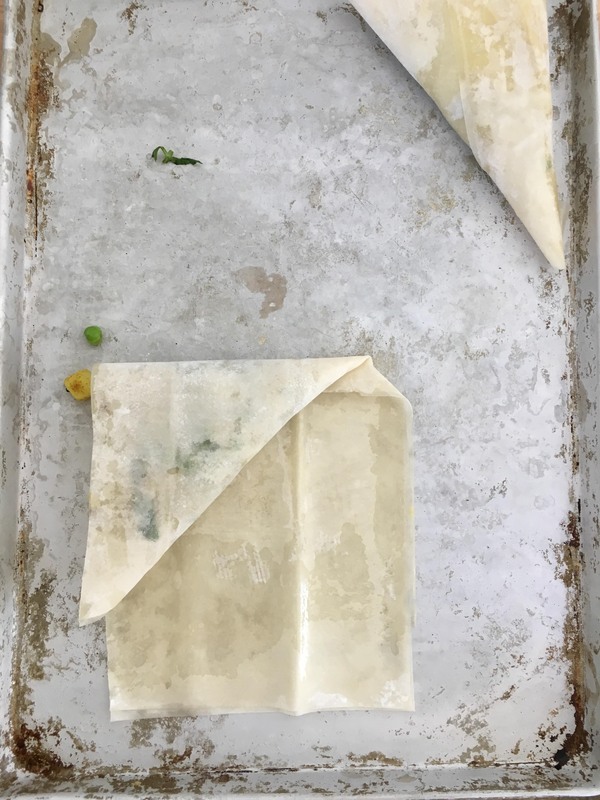 Preheat the oven to 200 and line a baking sheet with parchment. Cook the potato in boiling water until just soft then drain. Warm the oil in a frying pan and gently cook the onion and garlic with a pinch of salt until soft but not brown. Add the curry powder or garam masala and cook for a few minutes followed by the onion seeds, cooked potato and peas. Leave this on a gentle heat until the peas are defrozen then add the squeeze of lemon juice and taste for seasoning. Cool a bit and then add the chopped coriander before assembling. Cut the filo in half lengthways for the larger size or smaller if you are going the canapé route. 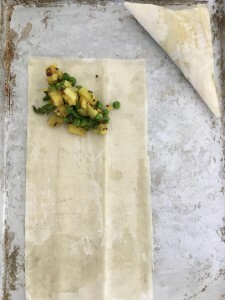 With a short side closest to you, brush lightly with oil then place a little filling on the top and fold the pastry over and then down until you have a triangle. Repeat until you have used up the pastry and filling then bake for 15-20 minutes turning half way, until crispy, golden and irresistible.